DSquadro is, as its creators Daniele Piazzola and Stefano Nodari explain, a "creative-technologic laboratory" through which they self-manufacture and sell their projects. 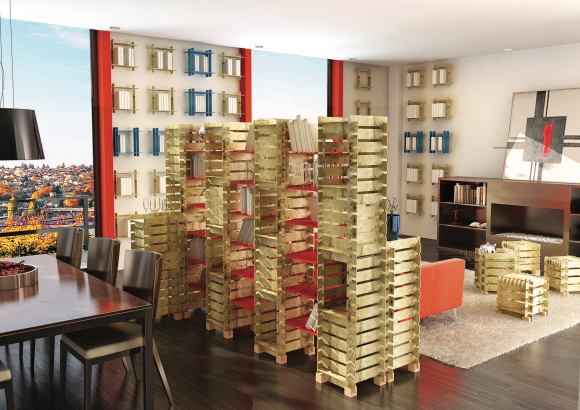 Daniele and Stefano are two architects, graduated at Politecnico di Milano and specialized in sustainable design. "We always worked together, we strongly believe in our ideas and concepts, so much that we decided to concretely develop them founding DSquadro". Sustainability is their project's main point and we started from that concept to know DSquadro better. What are your projects inspired by? We want to propose useful and consciously developed projects. 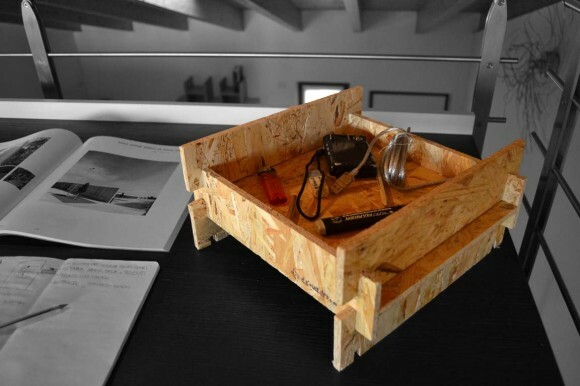 This one was born as a solution to reuse, in an original and new way, fruit markets wooden crates. We cleaned, dismantled and then reassembled mountains of crates, but in the following prototyping steps we decided it was more productive using other waste materials that are stronger and require less work. We think "useless" and "waste" are an unlimited chance to experiment, an important testbed in creating original and responsible projects which can offer a different perpective to the final object and an interesting starting point to reflect on materials' value and our lifestyle. A project's appeal can't come only from using "glam" and glossy materials. On the contrary, using just "poor" materials should be considered an added value because it lets us focus our attention on an object's pure form and function, without being distracted by glittering aesthetic effects. Which materials and techniques do you use, then? We mix traditional manufacturing techniques with new ones (like lasercut and 3D printing), craftsmanship with mechanized processes. We make experiments in any application field we can - from architecture to product design, from sustainable mobility to fair booths fitting - and with the most diverse materials - from wood to resins, from cardboard to magnets - always looking for resources and manufacturing process optimization. Our objects are completely made with 9 mm OSB (Oriented Stand Board) panels with no finishing, to show their unique texture, or colored with a dripping technique. Each single module is shaped so that you can join it with other modules using just your hands, with no tools; some special pieces will mark out the specific use of different complements. We created more than 15 configurations of "standard" objects: each of them can be disassembled and reassembled with another to create always new and personal configurations. The joint system is designed to maximize performance and strength. Yes, JOIN is a kaleidoscopic modular snap-fit assembling system which offers a free configuration of furniture and furnishing complements, in a completely reversible way. Limiting it to a single object would be wrong. The "en JOINt it" project is an invitation to get into the game - a boxed game, to be precise - with which we wanted to put the user at the center of the creative process, giving him/her what he/she need to build the object he/she wanted and to modify it following his/her creativity. All our objects are sold in an assembly kit with specific instructions. Therefore, a product doesn't "consume" its function when it's been assembled but becomes an useful instrument to effectively react to your always changing daily space needs. You tested also a crowdfunding campaign. What did you get from it? Much less than we actually expected, maybe because design projects aren't exactly Eppela's core business or because Eppela hasn't the same recognisability, appeal or user base of other more famous platforms. In the end, it partially worked as an advertising medium but we got quite short from our final goal. Anyway, it's a very interesting concept and we believe we'll try it again in the future, leveraging the experience we made this time. What are you working on for the next future? We keep working as architects, but we keep also experimenting on new concepts and ideas we want to introduce as soon as possibile. Speaking about product design, at the moment we're developing a chair for kids, a desk accessory and a project - which we believe it's very important - of an urban biketrolley for sustainable mobility. Interested? You can also visit DSquadro store on MakeTank.